New Home Improvement Products – Are They Really New? referral links. Click to read disclosure policy for more info. After a week reviewing popular new home improvement products at the world's biggest home industry event, it's a bit intimidating trying to summarize what I saw. Imagine gazing on hundreds of doors and windows, kitchen cabinets and appliances, bathroom, lighting, flooring products and so much more. Then I watched a short video by GreatBigStory.com, on the last hand-set (90-character machine) newspaper in the US. It illustrated how new products may evolve but the underlying purpose remains unchanged, like publishing more information digitally but the goal of sharing ideas remains the same. In fact, the popularity of fireplaces measured by how many displays there were at the home show, tells me there's a bit of nostalgia in all of us. We certainly don't use our fireplaces for warmth or cooking anymore. And even though we know how inefficient many fireplaces are, our love affair with fireplaces continues with more creative ways to add them into our homes and lives. There were lots of traditional fireplaces scattered around the event. 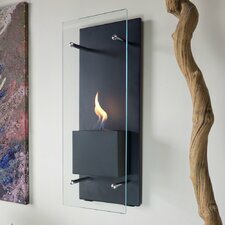 What captured my imagination were the new fireplace styles, smaller and many of them wall mounted (check out fireplaces at Wayfair). They're meant to let you to tuck a fireplace into a nook or bathroom, without dedicating an entire wall … so now you can have two, three or more fireplaces in your house. Somewhere there was a hint that every master bedroom needs a fireplace. But that depends on how much time you spend there, along with your lifestyle. We had a wonderful brick fireplace in our Williamsburg colonial, but only uses the fireplace once. That's because of my newborn son who took all our spare time and energy. While I love the look of the new free standing bathtubs, it's unclear how many homeowners truly use them enough to justify the space and investment. You need time to run the water, and hopefully you won't get distracted before hopping into the tub for a nice soothing soak. In fact there are now heating products to heat up the walls of your bathtub, similar to the radiant heat used in flooring. For those you love to spend a fair amount of time in the tub, that's a luxury you won't want to miss. So if you'er excited about finally getting a free standing tub, or even a radiant heated bathtub, a good place to start your search on Wayfair with their extensive collection of bathtubs from Kohler, Aquatica, Giagni, Kingston Brass and many other brands. You probably spend more time in your kitchen than any other room, unless you've got a home office. As we find more ways to use our kitchens, we collect more gadgets. When they're not being used, they need to be stored somewhere and “kitchen storage” was one of the highlights at the show. We're not talking about any storage. There were several cabinets that delivered flexible solutions for seniors. The cabinet shown above isn't like any you've seen before. Rather than having to reach up to access things stored on the shelves, the entire set of shelves moves down for ease of access. Wellborn Cabinet also showed an “Electric Countertop Lift” with a butcher block top that can be raised to various heights with the push of a button. Continuing down to the base cabinets, there are lots more creative ideas for storing those hard to organize kitchen items like knives and over-sized cooking and serving utensils. The pull out cabinet places all of these at the perfect level to see and grab exactly what you need, right next to the stove so you don't have far to go. Kitchen cabinet makers have gotten the message that it's not just how beautiful the cabinets are on the outside. Kitchen cabinet manufacturers almost any type of built-in, and there are several specialty companies like Rev-a-Shelf, that offer organizers for almost any kitchen storage challenge you're facing. 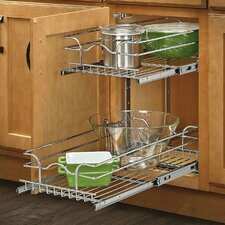 There will several different types of drawer organizers with hardware specifically meant to store the lids of pots, pans and even food storage containers.